Home > Living > Kleenex Hand Towels – an Enviornmental Waste! Kleenex Hand Towels – an Enviornmental Waste! We have Tivo, so I don’t sit and watch that many commercials. But this one happened to catch my eye. A new ad for a Kleenex hand towel. A product that supposedly will replace the standard hand towel people use. They tout their Kleenex towels as being the solution to combat germ spreading in the household. Who are they kidding? Do they have any idea the adverse impact all those extra disposable towels will have on the environment? For years now, we have been trying to make a move away from disposables. While some things, like diapers, are more difficult to make the transition to than say, using a cloth napkin instead of a paper towel, this move to use disposable towels in place of our usual cotton hand towels is definitely a backwards move. When I saw this commercial I just couldn’t believe my eyes. Were they really telling us to use disposable towels in our bathroom? To illustrate their point, Kleenex shows dozens of people using a cotton towel (including the household dog), and it gets quickly dirty and dirtier as, on the opposite side, kids reach for clean, fresh Kleenex towels. And then there’s this video, created as a parody. Kleenex disposable hand towels do not help kids stay healthier. They do kill trees and are harmful to the environment. What Kleenex is doing is targeting “germ conscious” shoppers, in particular moms, who are concerned with their kids safety. They even say on their hand towel website that “regular washing of cloth hand towels does not ensure cleanliness.” Does that mean we should all wear disposable clothes? The irony is, the more sheltered and germ free a kid is, the weaker their immune system will grow and thereby in the long run the more sick kids we’ll have. And the fact that Kleenex is using this aggressive marketing tactic to take advantage of mothers’ fears is downright despicable. To top it off, they round out the whole commercial with a catchy jingle that will no doubt cater to all the kids out there. To us, this is the environmental equivalent of marketing tobacco to kids. By encouraging the next generation to use disposables, Kleenex is taking a huge step backwards, and in the process potentially pushing to undo years of work to move away from environmentally wasteful disposables. Roll up your sleeves and I’ll sing with you. It’s hard enough for consumers to fight for the environment, individual by individual, when we have large corporations with large marketing budgets making a push in the opposite direction, and undoing the work millions of us do on a daily basis to help our planet and its inhabitants. So, we at Earth’s Friends feel like it’s our responsibility to the planet to push back. You can join us, and help the environment, by committing to not buy Kleenex products until they pull their disposable towels from the shelves. Voting with your wallet is one of the most powerful things you can do to make a difference. I use to be a person that was on the bandwagon of building my immune system and not over disinfecting my hands and surfaces around the house. But now I have Herpes Type 2 and HPV on my hands. In order to keep from spreading these to other people it is my responsibility to use a separate towel and wash surfaces I come in contact with. Even reusing the same towel on my self can reinfect me in different places. You can get more then just a cold from using the same towel with someone. I don’t think these should be for everyday use but I think there is more to this, that is not being talked about. Sara, so sorry to hear that but yes that is definitely something to consider when re-using towels! Thank you for sharing. It is clear, then, that while you as a parent should take care that your child is not getting sick constantly, that being over-protective and germophobic is quite counter-productive. The marketing to children themselves is, I agree, a despicable tactic. The product is wasteful and un-necessary, although these are two concepts children most likely will not completely understand. Instead of saying, “No” to the product and therefore making yourself the villain in the eyes of your children who might feel they are doing what they can to be germ-free and healthy, turn this into a ‘teachable moment’. Use this time to explain why these products are not actually what the commercial claims they are, and to talk about environmental impacts and re-using instead of throwing away. I think education is really the only way to combat the unfortunate way that this, and other marketing, targets children. There could even be a lesson in it for children about not believing everything you see on television. The author, who is an affiliate of the environmentalist group Earth’s Friends, calls for a boycott of Kleenex products in protest of this product and other products. Having a basic understanding of economics, I support this call to action. It is clear that the commercial and marketing campaign used for Kleenex Hand Towels is misleading in the message that it helps prevent the spread of germs, and is mis-targeted at children. The product is also wasteful of resources, cheap-looking, and wholly un-necessary. You vote for which products you want with your dollars, and if you do not think that Kleenex Hand Towels are good for the Earth, let your absence of buying them send the message. After that, wash your hands with some warm water and soap, and dry on a comfortable cotton bathroom towel. I mean who hasn’t been waiting for environmental groups to chime in on these babies. I mean the first time I saw a commercial, I was like, “this can’t be a new product! Is this from the 70s? How do people come out with a new product that is more wasteful than anything on the market today?” “What were they thinking,” is the understatement of the year. I am surprised they are still on the market, but I guess the allure of a constantly clean towel keeps customers loyal. For those of you who don’t know, Kleenex Hand Towels are marketed as a fresh towel from the box that can be disposed of after each use. The disposable hand towels are marketed as a cleaner, more sanitary option than traditional, re-usable cotton hand towels. The axe seems to have fallen for this product, and environmentalists on all sides of the issue have come out against it. As one Enviro-blogger points out, the argument Kleenex is using for product promotion is that it makes us safer and less likely to get sick or diseased. But the lack of any evidence that such a claim is true in the home means that these hand towels need to be given the wave goodbye. The author discusses the germ-prevention angle as a marketing gimmick rather than a statement of fact. The product is most clearly targeted at germophobes, particularly moms, and although I am not a mom myself I can see how protecting your child against getting sick by catching someone’s germs off of a hand towel can be a potentially disturbing situation. Truly, though, I have never caught an illness or even ever heard of someone catching an illness off of using a clean hand towel in my own or someone else’s bathroom. A quick search online reveals very little information about the occurrence of this situation, either. This makes the commercial stand out even more as a definite ploy to exploit the natural protective emotion that moms have in order to get them to spend money on something they ultimately do not need. And the product is not needed in the home at all, it seems. Therefore it is even worse, as an unnecessary product that wastes a lot of trees and resources, yet does not in fact provide any added benefit to the consumer for the money spent. Spending money on it might actually get you to wash your hands less, which is, as one environmental group sharply pointed out, an actual violation of a strong CDC recommendation. The author makes a good point about what is known as the ‘hygiene hypothesis’, as well. As touched upon in the article, the hygiene hypothesis states that children will develop stronger immune systems by being exposed early-on to different, non-life-threatening germs, and this will prevent them from developing allergies later in life. You may have heard of children before the vaccine was available contracting chicken pox or mumps from another child on purpose, and the reasoning was similar: Children will have milder symptoms than adults, and then will have an immunity built up for life. Same thing goes for allergies: Allergies are thought to be an over-active response to germs from a weaker immune system. Earth’s Friends cites this same argument that Kleenex uses about sanitation, pointing out that it is targeting its products toward germophobes, as well as over-protective parents. Snarks one blogger from Earth’s Friends, “They [Kleenex Hand Towel marketers] even say on their hand towel website that ‘regular washing of cloth hand towels does not ensure cleanliness.’ Does that mean we should all wear disposable clothes?” The author goes on to cite modern hygiene hypothesis arguments, stating that keeping children in too sterile and germ-free of an environment ends up weakening the immune system and is a principal cause of allergies. While the overwhelming environmentalist response has been a negative out-lash against Kleenex and Kleenex Hand Towels, some environmentally-conscious groups have thought things through more carefully. One blogger interviewed Inform, Inc. environmental activist and representative Ted Scovell to find out where Inform stood on the issue. Scovell responded thoughtfully in the interview by pointing out, “It’s incredibly complicated to figure out which way is more efficient.” Many different factors go into determining the environmental impact of a cloth towel versus disposables: Costs to manufacture, transport, and market a cloth towel or a box of paper towels, plus the water, soap and energy costs to wash and dry the cloth towel versus transport the paper towels to a recycling plant and to actually recycle them. Scovell ultimately comes down on the side of re-usable cloth hand towels, however. The reasons he gives seem to resonate with other environmental groups’ opinions; namely, that the Kleenex Hand Towels use trees to make the paper but will not make you or your family any more healthy or safe. He also went on to cite how paper towels are seldom recycled, and furthermore that after the recession hit, there was a lot of paper that was scheduled to be shipped to China for recycling that never actually made it there. Plus, recycling itself takes energy and resources, and is not a reliable way to make sure you are being environmentally-friendly. A smaller minority of environmentalists, based on the facts about paper recycling, believe that tossing paper in the trash is a better, more green option. These groups cite that paper most often comes not from forests as people these days believe, but from planted tree farms. Tree farms are maintained and trees are allowed to grow continually on the farms, purifying air and water, and giving off oxygen into the atmosphere. Further, they argue how easily biodegradable paper is, and that, unlike other waste such as plastic, paper will not sit in landfills for centuries but rather will enrich the soil and environment around the landfill. I want to insert here that another concern, that is not purely environmental in nature but that many bloggers and environmental groups have brought up, is that the Kleenex Hand Towels have a trashy, cheap feel and look to them. One blogger wrote that the towels “make any bathroom seem one-hundred and twenty-seven percent more like a gas station bathroom”. True, the disposable box pushed into a regular hand towel rack does remind me of a public rest room more than a comfortable plush cotton hand towel would. Although I have never tried Kleenex Hand Towels, nor would I, I would definitely say that the scratchiness of a paper towel does not have nearly the same connotation of luxury as a cushy cotton bath towel. Not all environmentalists were as quick to jump onto the bandwagon for disliking this product, either. Some groups, for instance, have examined closely the environmental impact of treating a new hand towel and disposing of it each time, versus the energy of creating one hand towel and washing it in the laundry regularly. The higher negative environmental impact of the paper towels has ultimately rested on fact that the disposable hand towels are rarely recycled or if they are, there is energy associated with recycling the old paper into new products. There are other aspects of energy input to consider as well, such as the box, bleaching and dying, and transportation costs. The impact of cutting down trees is debatable in these environmentalist circles, as the trees grown in tree farms decrease carbon dioxide and release oxygen into the air, and after they are cut down, new trees are re-planted in their stead. This would make using disposable paper products more environmentally-friendly than using recyclable. These groups also point out that after the recession hit, a lot of recyclable paper that was slated for shipment to recycling plants in China was simply never sent off, meaning that it is just sitting and not even getting the benefit of being broken down in a garbage dump. These feelings represent the minority, however. And even such, because of the misleading advertising, bleaching, and so forth, most of the environmentalists in this camp still come down against Kleenex Hand Towels. This is just another mind game developed by a big old corporation who wants to cash in on all the germ fears created by big old corporations — antibacterial soap, disposable cleaning wipes, yadda. In doing so they are destroying our environment with tree-killing, greenhouse gas emission-spewing, landfill-populating disinfecting products (that actually make germs stronger) that generate the ‘need’ for more inane products. One of the arguments Kleenex has stood behind is the Center for Disease Control (CDC) recommendation that supposedly called for single-use towels when drying your hands. Environmental activists, however, were quick to respond to this assertion by browsing the internet-published guidelines. When the Good Green Witch, whose real name is Bridge, found that the CDC guidelines called for the use of hand dryers and single-use towels only in public restrooms and not private homes, she decided to call the CDC for clarification. A CDC representative responded that the claims on the Kleenex website were “alarmist, vague, and misleading”, and clarified that the recommendations indeed did not apply to towels used at home. Environmentalists of all types were aghast at hearing the news of Kleenex Hand Towel release. The product certainly raises a lot of questions about environmental friendliness, including many of the issues brought to light in this article. The article falls squarely against the idea of Kleenex Hand Towels, and I agree, although there are counter-arguments that environmentalists could make to some of the claims made by the author here. Altogether, though, it is certain that the claim made by Kleenex itself about the towels being a better way to prevent the spread of germs is misleading at best, and arguably not worth the cost that Kleenex Hand Towels have on the environment. The Kleenex Hand Towel commercial depicts a screen with a divider, with one half of the screen showing a bathroom towel being re-used by everyone including the family dog while the other shows a bathroom towel rack with Kleenex Hand Towels on top of it, each person grabbing a new, disposable paper towel. The commercial stresses that it helps combat the spread of household germs. The commercial itself has raised many red flags in the environmental community. In this article, the author states his astonishment at the admittedly wanton waste of paper being depicted in the commercial, as well as agreeing with the video parody in which the actual number of sheets of paper thrown away are tallied up. I personally agree with this gut feeling of wastefulness being depicted when I first saw the commercial itself, as one of the things I have been taught since grade school is about re-usable towels being much better for the environment as well as more efficient. The author of the article avers that the paper hand towels kill trees and are harmful to the environment, and this sentiment is difficult for me to disagree with, considering all of my education on the matter. Ok those are so pretty doable- thanks for the great article. What a darling blog I am off to prowl around! I can’t believe people still don’t understand how germs and bacteria work. If you isolate yourself you will be far more prone to sickness. If you allow some germs into your life you build up an immunity to the diseases. It’s like a built in immunization. On the main topic of this thread I completely agree that it is outrageous that Kleenex has come up with this product. I’m pretty sure people do still wash towels. Nobody is going to reuse a towel the way it is pictured in the commercial. I agree with the boycott. I appreciate the time and effort the writer took on this and I agree with him or her for the most part. What bothers me is all the links at the top of this article to get coupons for free paper towels. Is this site really supporting your support for the environment? I’m guessing that must be one of the advertisements placed within the content. That is ironic. We’ll see if we can filter those out. Interesting conversation here. I would say Kleenex hand towels can be more environmental if you use them like I do – to wipe your @ss. They’re bigger than toilet paper, so one sheet will do to wipe my entire @ss. Considering the size of my @ss and how much toilet paper I normally use, this is saying something. Go Kleenex! No actually in the long run we will have less sick people if people learn about cleanliness and the importance of frequent hand washing, and making sure things are disinfected. Reason we will start to have more sick kids in the long run is because of all the people freaking out about vaccinations. I have actually seen less children sick than ever since all these extra disinfecting stuff came out in the past year. Such as the hand sanitizers where ever you go and stuff to wipe down carts. There are people who are getting sick less and less. You’ll notice that the posting time of all the “pro Kleenex hand towel” comments on this page are within minutes of each other. Hmmmm – maybe the same person hired from Kleenex to do some damage control? Anyways, look – your argument makes no sense. First of all, as many have pointed out this article is about the environmentally unfriendly nature of Kleenex hand towels. If the environment goes down the toilet, we have bigger problems to worry about than getting a cold from a hand towel. But the real irony? You use a hand towel AFTER you wash your hands, so it’s probably the most germ free thing in your entire house. Our family has healthy kids that have been using cloth hand towels for years. They play outside in the mud, eat their fruits and vegetables, and don’t freak out over every little germ they run into. In fact, the problem with this “disinfectant world” that we live in is that it’s killing the good germs as well. Ever notice how allergies for school children are on the rise? Kids immune systems are becoming weaker than ever because we are killing the good bacteria. Nature created a balance that has worked for thousands of years. Otherwise we wouldn’t be here today. Unfortunately for us, companies like Kleenex are doing their darndest to undo that balance, just for a quick buck. Very, very sad to see a large corporation negate the hard work of so many well intentioned individuals. You have seen less sick children lately? What are you basing this on? By observing children in shopping centers?? I’m a teacher and I can tell you that I haven’t seen much of a reduction in sick kids in the classroom, despite the presence of all that “extra disinfecting stuff”. As the other reply to this message says, allergies are actually becoming more prevalent among our children as all these products continue to pop out on the market. Companies like Kleenex prey on parental and individual FEAR… and the people who fall for it are either lazy or really know nothing about “cleanliness”, but are made to believe that they do. These ridiculous Kleenex home towels do nothing to protect people from harmful bacteria and only add yet another product to our landfills and water reserves. Just as public washrooms start to make an effort to replace paper towels with touchless dryers, this company makes the public believe they are being cleaner and therefore stay healthier by using and tossing. You have seen fewer sick kids lately? Based on what? The kids you see out and about in shopping centers? I’m a school teacher and I can tell you that I have not seen a significant reduction in the number of sick students, nor the severity of their illnesses, despite all of the “extra disinfecting stuff” being shoved out into the market. Or, you could go to a walk-in clinic on any weekday and see for yourself that people are not getting sick “less and less”. In fact, as another post mentions, allergies amongst children have been on the rise, especially in bacteria-obsessed North America. These companies prey on individual and parental FEAR, and the people who most often fall for it are either lazy or really have no idea about “cleanliness” but are made to believe that they do and that they are in fact obligated to make their home “bacteria-free”. Just as public washrooms are more often replacing paper towels with high-efficiency hand dryers, Kleenex brings out these ridiculous hand towels to place in our very own homes. They do nothing to protect us from harmful bacteria but they DO add yet another item to our landfills and water reserves. When I saw this commercial I got really excited. Because I know how much bacteria my hand towels hold, I put out a new dish rag, hand towel etc every day and sometimes more than once a day. I always use paper towel to clean, and anything disposable to clean to cut down on bacteria. Or else disposable Clorex wipes. I think it is better to move away from disposable stuff for things that do not hold bacteria. But we have for the most part done that already. Just thinking of using cloth napkins makes me cringe. Think of our recent pandemic, and the stomach viruses that go around in the winter. You have to use hot water and bleach to remove that from your hand towels when you wash them. I am all for the anti – bacterial, germ spreading preventions, disposable or not. Finally a solution for germy hand towels! Fear is a powerful marketing tool, but that doesn’t mean it’s right for the Earth. To the poster above – you’ve got to be joking right? How much does Kleenex pay you to post on here? This article is about the environment. Bottom line – Kleenex hand towels are hurting the environment, which in turn damages our health far greater than a few germs on hand towels. In addition, aren’t hand towels for drying your hands after you wash them? So your hand towels are probably the least germ containing thing in your house! The Kleenex hand towel product is the most ridiculous, environmentally unfriendly thing to arrive on the market this year. I thought the same thing when I saw this commercial. I recently switched to cloth napkins completely and use paper towels very rarely. I already feel bad enough when I see all the waste produced at my job. (I am a nurse in a hospital.) I cannot imagine using a disposable “towel” to dry my hands in my own house!!! They may as well show a commercial of people chopping down a tree and wiping their hands on the bark. Yes, I was livid when I saw that ad. Don’t forget that Kimberley Clark also produces Scott paper products, Cottonelle, Viva, Depend, Kotex, Huggies, Pull-Ups and Good Nites. I was extremely happy when I saw this ad. 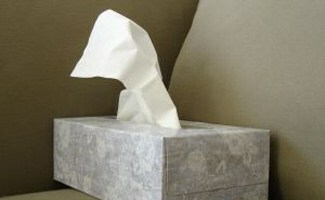 I think everyone needs to get their heads checked on this site about boycotting Kleenex. Well I will make sure I support them fully. They have anti viral Kleenex, paper towel excellent for cleaning and preventing cross contamination, I am glad to find out that Scott paper towel is part of the Kleenex company I now know which paper towel company I will always purchase. The perfect anti bacterial cross contamination prevention. I wanted to run out and buy some tonight unfortunately it is 11pm. Ummm, and let me guess – you work for Kleenex? This article is about how hand towels are harming the environment, not about their disinfectant properties. Trust me, in the long run, if we all start cutting down trees to make Kleenex (and Scott, since you mention it) hand towels, we’ll have bigger health concerns to worry about than germs on hand towels. Besides, most people that use a hand towel just washed their hands – so your hand towel is probably one of the cleanest things in your house! Duh!!! There’s a gazillion other things that people touch in your house before washing their hands that have more germs in them then your environmentally damaging hand crap. Aren’t these towels compostable – say in a city’s green bin program? My thought would be that washing towels does as much damage from a carbon footprint perspective as composting a paper towel. I kinda liked the idea but only if they are able to be put in the green bin. From a forestry perspective, I think that Kleenex is now FSC certified which they didn’t used to be. That’s why I started buying them again about a year ago. In this case, I don’t think it matters if they are compostable. The issue, to me, is that this is misuse of resources. Even if they happen to use recycled paper to make these paper towels, this is not an essential use of resources. And if they end up being used once and thrown in the compost, that is definitely not the best use of the tree that was killed to make the towels. This isn’t just a waste management issue. As for the carbon footprint question, imagine using paper towels in the bathroom while still washing your laundry, including bath towels, wash clothes, and bath mats. It’s a double whammy for the environment. You’re still going to have essentially the same carbon footprint in terms of doing laundry, but also be contributing to unnecessarily cutting down trees that mitigate the carbon problem and/or using up valuable recycled resources that could be used to produce more necessary products. I’m really just playing devil’s advocate here but I’d be interested in hearing what you think would be a good use of these resources? I’m not really that interested in ‘germ protection’ as I feel like the less you are exposed to germs, the weaker your immune system will be when you need it – but I don’t see your point about this being a misuse of resources. I don’t think they’re chopping down the tree in your front yard or the park around the corner, these are tree farms that are managed responsibly and overseen by an environmental organization. I’m just wondering but would you rather we not use any trees in the production of anything? Wouldn’t that be a bigger mistake for the economy and the true misuse of the natural resources that a country has as one of its greatest assets? I’m from Canada which has a rich history in logging and responsible forestry and without that industry, we would be in a much different place today. Carbon footprint is such a difficult thing to measure given that everything in the world has long list of production cycles and would be difficult to quantify and measure against one another. I do agree that if you were to stop using cloth towels that your laundry loads would probably not go down any but what is the footprint of that towel before you purchased it? Could be quite lengthy, especially if it was an overseas product sold at a large chain store. Lots of shipping and storage involved there. Just food for thought. My main point of this and my first post was to just stimulate a few thoughts that maybe this product isn’t as bad as it may seem on the surface. I don’t think I’ll be using it anytime soon but more so because I’m not really overly concerned about household germs. I’d love to hear your thoughts on my comments above. Excellent points you raise here, thanks so much for sharing them with our community. I think in many cases we probably are not aware of the big picture, and it helps to have “industry experts” chime in and expand our perspective. I think one of the more grating issues with the Kleenex campaign is the kind of “fear mongering” they use to take advantage of mother’s concerns for germs. This is an aggressive marketing tactic, that, independent of environmental impact, is disappointing to see used by a company that has such a wide reaching impact on the psyche of the populous. I could not believe this commercial either!!!!! I sent an email to Kleenex/Kimberly Clark regarding their new disposable towels. I mentioned the fact that you wash your hands before using the towel so shouldn’t your hands be clean when using your hand towel??? If people are truly concerned about germs, why not just have a different color hand towel for the sick family member? These disposable hand towels are only going to create more waste for our landfills. I will no longer buy their products until they discontinue their disposable hand towel product. Thanks Earth’s Friends!!!! The Earth needs all the friends that it can get!!!!! Wow, thank you for writing this article! I saw the Kleenex hand towel ad when it first came on television several weeks ago. And boy did it stress me out! Not only that, but I was suffering from severe allergies at the time so believe it or not was in the middle of nursing my runny nose with a box of Kleenex. I promptly went to the grocery and bought a competitor’s brand. While I don’t feel like I should simply trash the Kleenex boxes I have (that probably won’t help the environment either), I’m going to not use them until Kleenex either issues an apology or takes action against this outrageous move. Kudos to Earths’ Friends for addressing this issue!